This is a beautiful accompaniment to my Parsi-braised chicken but would be equally lovely with a roasted chicken or you could swap the labna for some browned haloumi to make a more substantial vegetarian dish. 2. Wash and scrub the carrots and cut off the green tops, if they have them. Drizzle with olive oil and sprinkle with salt. Roast them in the oven for 30 to 45 minutes, depending on their size. You want them to be completely soft and caramelised all over. 3. Meanwhile, put the butter in a pan over medium heat and allow it to melt and turn into brown butter, swirling the pan occasionally so it cooks evenly. When the butter has coloured to nut brown and remove it from the heat and add the citrus zest and the picked thyme leaves (be careful as it will splatter). Add the honey and the juice of half a lemon. Mix to combine and keep warm until ready to serve. 4. 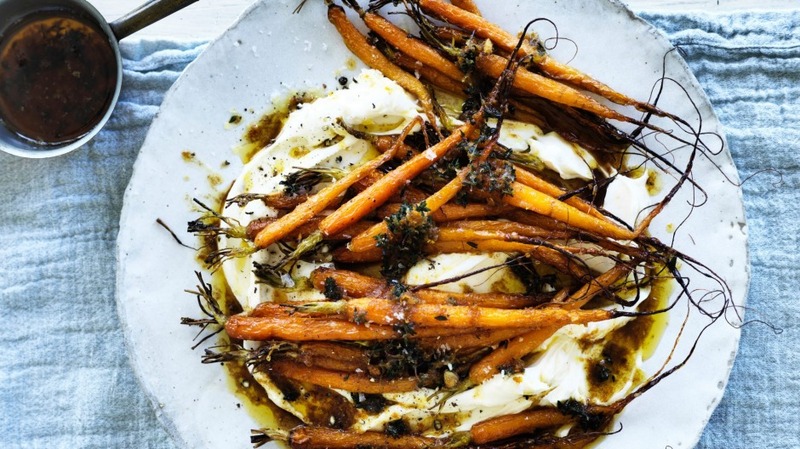 To assemble, spread the labna at the base of a serving platter, arrange the carrots on top, then pour over the brown butter sauce. Finish with a sprinkle of sea salt.